Around & About Bus Hire Tours offers a number of transportation services to individuals, corporate bodies, school or education groups, social groups, and government groups. We are well placed to assist. Transportation for team building days or other corporate events are easily dealt with by our attentive staff. We are passionate about delivering the best service levels at the lowest possible prices. Contact us today and let us help customise your transport options so you always get the RIGHT service for the RIGHT price. When it comes to your next trip to or from the airport, why not let us take the hassle and strain out of things? Our airport transfer service means no restrictions on pickup or drop off. Sit back, relax and enjoy yourself, with our trained drivers helping to get you where you need to go. Catch a nap before your flight, or get some last minute work done on your way. The best part, let us deal with the traffic. 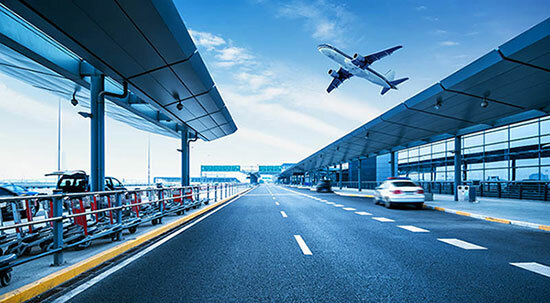 When you book an airport transfer with Around & About Bus Hire you will save time, money, and cut down on the frustration of getting yourself and your group to one of the busiest locations in Sydney. 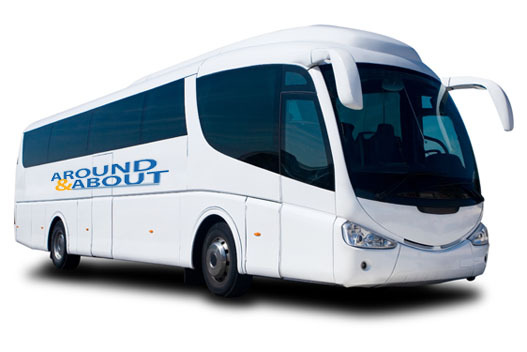 Around & About Bus Hire provides airport transfers for arrivals and departures 7 days a week 365 days a year. Small to medium size groups of all kinds take advantage of our minibus charter services. Ideal for social groups, team building events, wedding parties, hens/bucks nights, golf days (plenty of room for a foursome and all the clubs) religious groups, corporate groups, and more. Experienced drivers with local knowledge of roads will serve to get you and your group where you need to go, with the absolute minimum of fuss or hassle. **Currently we do not contract any of our vehicles without the presence of a driver. Affordable options are available no matter what type of transportation you are looking for. With all age groups covered, we are proud to deliver a safe and reliable service, even arranging transport for teachers and parents as well. Corporate clients use our bus and mini bus charter service for company training seminars, travelling to exhibitions and tradeshows, along with team building events. Off site training sessions are often much more powerful when group transportation is provided. Receptiveness to training can be improved when employees don’t have to battle traffic on their own, not to mention the benefits of everyone arriving at the correct location and on time. Whether you need to move a small group or a small army our affordable corporate bus charter service is tailored to your exact specifications. The next time you are thinking about any form of corporate event and need reliable cost effective group transportation, think Around & About Bus Hire. Social groups enjoy our bus charter services as well. Whether you are planning a golf day, a shopping trip or a relaxing spa day with friends we can get you where you need to go. Pretty much any event you can think of can be organised with group travel in mind. Some of our clients use us to provide wedding guest transportation, we take the hassle out of getting groups to the wedding venue and then on to a reception event. You can relax and enjoy your biggest of days, safe in the knowledge that guest transportation is being dealt with by one of Sydneys most reputable transport providers. Around & About offers comprehensive bus, mini bus and coach charter services for corporate groups, social groups and school groups. The next time you need to organise any form of group transport, don’t leave anything to chance. We offer sightseeing tours to groups of all sizes. Whether you are planning a trip to the Blue Mountains or fancy the idea of a Hunter Valley wine tour we are happy to assist. Let us know how many will be going and we will help you select the right coach for the occasion. First time visitors to Sydney are always amazed by the stunning Three Sisters rock formation on our Blue Mountains tours. Take a once in a life-time trip in the world’s steepest incline railway car and finish of your visit in one of the many eateries or restaurants that this stunning region has to offer. Wine lovers will be thrilled by the splendour of our very own Hunter Valley region. Let us know what types of wine you like and our team will happily plan a great day out for you. Group bookings for lunch can be quickly and easily arranged on your behalf, with our friendly event planners working hard to make your trip a memorable one. Why not contact our friendly team today to get your booking organised. Contact Around & About Bus Hire and Tour today for all your bus charter needs. We welcome any size group. Call us today on 02 9980 8999 or fill out our online enquiry form.